I woke up to the last day of 2008 with a kitchen full of spotty bananas. Oh joy. So the agenda for today was to make baked goods out of all those over-ripen fruit. I love muffins for breakfast except that they are so high in calories, refined carbs, and fat! Luckily, flipping through Dreena Burton's Vive Le Vegan! cookbook, I saw her recipe for Banana Oat Bundles. 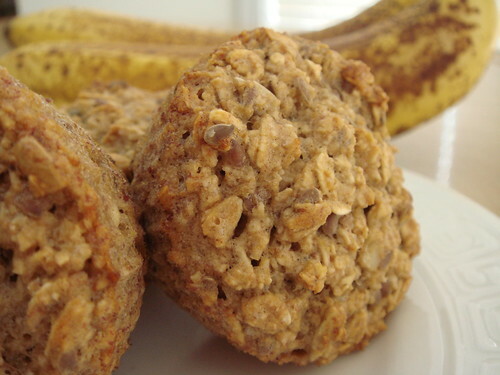 It is wheat-free, very low in fat, and contains just the minimal amount of unrefined sugar. How perfect is that! I immediately gave this recipe a whirl and I am pleased to report that it bakes up to a very credible banana oat muffin without tasting like "healthy food". This is definitely a recipe that I will make on a regular basis. I brought a couple as my mid-workout snack and it is a nice change from my usual energy bars. Adapted from Vive Le Vegan!. Preheat oven to 350C. Line 12 muffin tin with silicone or paper liners. In a large mixing bowl, stir together all the dry ingredients. In a small mixing bowl, beat together all the wet ingredients. Gentle stir the wet ingredients into the dry. Do not overmix. Divide batter to muffin tin. Bake for 20 minutes or until the top is golden brown. Enjoy warm out of the oven or at room temperature. Peanut butter is a main staple at my house but recently we've been experiencing a mini crisis with our supply. You see, after some extensive tasting, we've established an overwhelming preference for Jif peanut butter. If you look at the ingredients list closely, you would notice that it contains molasses which is not common in most other supermarket brands. That one little difference is enough to make a huge impact in taste. 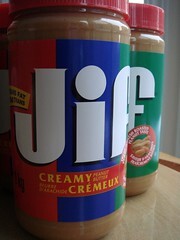 Unfortunately, store by store, Jif has been disappearing from the supermarket shelves here in the Greater Toronto Area. First it was the Loblaws family of supermarkets, then Metro, then Walmart. There's the occasional sighting of tiny jars in some specialty supermarket with an overblown price tag to match. My household is now down to our last jar and we literally ration it out in small portion in hopes of making it last as long as possible. Luckily, Jif has not completely disappear from the Ontario market. I went to my local Longos supermarket today and was delighted to see 1kg jars lining the shelf for a very reasonable price of $3.99! Of course I did the only logical thing and stocked up on peanut butter. It will be a few months before we run low on our supply again. I sure hope that I will not need to go on a quest for Jif when the time comes. 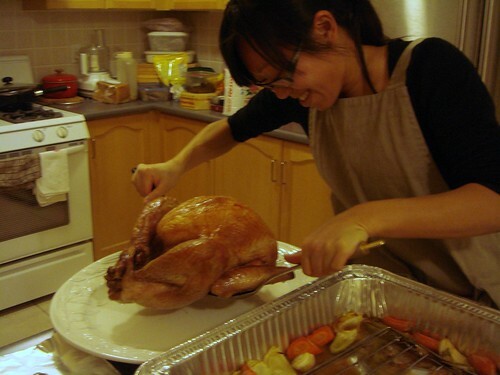 Earlier this week I had a sudden urge to cook a traditional turkey dinner with all the fixing for Christmas. As much as I'm fond of baking, cooking is something that I rarely do in recent years. Suffice to say, I'm a little out of practice. Browsing through any cooking magazines around this time of year would have anyone believe that cooking a holiday dinner is a daunting task. However, history tells me that roasting a turkey is suppose to be an easy thing. There is a reason why these traditional dishes survive hundreds of years and continue to be the dishes we make when we entertain a large crowd! Dec 22: The thought of cooking a turkey dinner entered my mind and refused to leave. The last time I roasted a turkey was at least five years ago! After my workout at the gym, I bought a President's Choice fresh young turkey basted with cultured butter. It's a tiny bird weighing in at merely 4.5kg. It's so small that it can be mistaken as a chicken. Dec 23: Menu planning in full force. I asked my brother whether he prefers potato or sweet potato. I had no intention to make both. 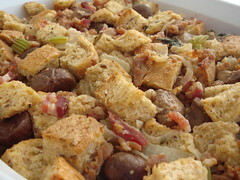 Stuffing would be my pick and I had my heart set on making it full of my favourite things. I bought all the ingredients necessary after plyos at the gym. I can't believe everything fit in my grocery tote! I trekked home in the snow with a big smile on my face. Finished making cranberry sauce in 30min. I love cranberry sauce. Dec 24: Turkey day has arrived! Oops, I had yet to purchase chestnuts for the stuffing. I thought for a moment of my very expensive bottle of French chestnuts from Williams Sonoma that is sitting in the pantry...nah, I have a more economical solution that is equally good! 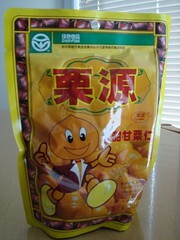 I drop by my local Chinese supermarket and got three bags of ready-to-eat chestnuts. They are preserved exactly the same way as their more expensive counterpart from France except that these chestnuts come from China. At only a quarter of the price, these would work well in the stuffing. It was already 4:30pm when I arrived home and I had plenty of work to do. I quickly rinsed the turkey and seasoned it with salt and pepper. I loosely stuffed the cavity with sage, thyme, onion, shallot, celery, and carrot. I lined the roasting pan with these vegetables and 500mL of chicken stock as well. 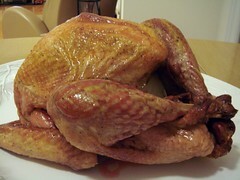 I tucked the wings under the body of the bird, massage it with vegetable oil, and set the whole thing inside the oven. Stock was up next. With only the neck and giblet, there simply was no need for a big stock pot. I filled a medium sauce pan with the turkey parts, carrots, celery, onion, bay leaves, and sprigs of thyme. I had a bit of down time so I proceeded with setting the table and vacuumed the house. I was in a festive mood! With only two hours away from the estimated finish time for the turkey, I began to prepare the stuffing. Whereas cranberry sauce is my favourite thing to cook in a traditional turkey dinner, stuffing is my favourite thing to eat. This was a stuffing full of my favourite things including multigrain sourdough, pancetta, spicy italian sausage, cremini mushroom, chestnut, and celery. Yummy! The stock was done by this time so I used it for the stuffing as well. My recipe yielded way too much stuffing for one baking dish or perhaps I was just a little greedy with tossing in ingredients. In any case, the extra was enough to fill two individual-size baking dish. How perfect! We would have our own dish of stuffing all to ourselves. I thought I would have a dilemma deciding between potato or sweet potato. As it turned out, the decision was made for me because the supermarket ran out of sweet potato. I bought a bag of mini red potato and decided to make my lazy smashed potato enriched with Boursin and yogurt. It's the easiest thing to make yet so tasty. By this time, everything was ready except for the star of the dinner. The turkey was roasting to a beautiful colour because of the maple syrup that I brushed on. I couldn't believe how gorgeous it looked! However, waiting for the internal temperature to reach 165F was the most frustrating thing. It plateaued at 150F and just wouldn't go any higher. After 30 minutes of humming and hawwing, I decided to end this waiting game and pulled the turkey out of the oven. Did I mention how gorgeous it looked? I couldn't believe that I actually roasted a turkey. While the turkey rested, I got started on the pan gravy. Oddly enough, there wasn't any burnt bits on the pan to deglaze. Hmm, oh well. 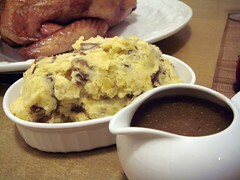 The gravy was a tad on the sweet side because of the maple syrup I brushed on the turkey. However, it tasted right. What was not right was my choice of thickener. I was brought up on classic Cantonese cuisine and corn starch is the way to go...or so I thought. My gravy gelled up mid dinner. My brother and I had a good laugh while we waited patiently for the goop to slide from the gravy boat to our plates. 9pm, dinner was served! Turkey was moist, stuffing was tasty, cranberry sauce was fruity, potato was creamy. I love spending the holiday with love ones over good food. Merry Christmas everyone! I thought 4.5kg is easy to lift. I was wrong. My hands were trembling just to move the turkey from pan to platter. 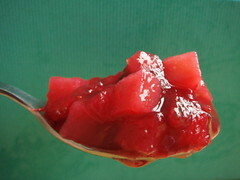 Cranberry sauce is my favourite thing to cook when preparing a typical holiday turkey dinner. Since it is so easy to make, I cannot imagine why I would ever bother with buying the canned variety. I am partial to chunky cranberry sauce but in order for the berries to fully release their pectin, they do need to be simmered until popped. The addition of firm diced Bosc pear is the answer! Ginger and Poire William eau de vie further enhance the flavour of this sauce to lift it from ordinary to extraordinary. This recipe yields about half of what most cranberry sauce recipes would. This is intentional because my family is small and I don't like clutter/leftover in my fridge. In a small sauce pan, combine all ingredients except for the eau de vie. Cook over medium-high heat. Simmer until most of the cranberries pop, about 10 minutes. Remove sauce pan from heat. Stir in eau de vie. Chill in airtight container until needed.